Rock City will amaze you...it's in our nature! Take an unforgettable journey along the Enchanted Trail where each step reveals natural beauty and wonders along the woodland path. 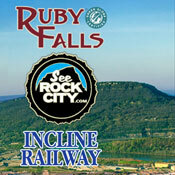 Rock City is splendid year-round - "Each season there's a new reason to visit!" 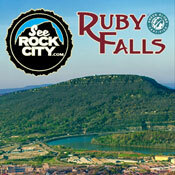 Rock City offers a variety of admission options based on the date of your visit. General Admission and Combination tickets must be upgraded at the Rock City ticket desk in order to visit on a non-general admission priced day. Check the Ticketing Calendar on Rock City's website for more information. The General Admission ticket is valid most days. An up-charge will apply to use a General Admission ticket on any non-general admission priced day. Rock City Gardens is closed Christmas Day. Hours of operation vary by season. Ticket expires one year from date of purchase. This ticket is valid for admission to one of Rock City's Premiere Events throughout the year - Shamrock City, EarthDayz, Southern Blooms Festival, Summer Music Weekends, Rocktoberfest, and select nights of the Enchanted Garden of Lights. Hours of operation vary by season. Ticket expires one year from date of purchase. 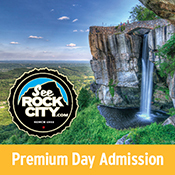 This ticket is valid for admission on a Premium Day at Rock City. An upcharge will apply to use this ticket on a Premiere or Peak Event date. Adult ticket includes admission to Rock City Gardens, Table Service Lunch with choice of Tuscan Garlic Chicken or Chicken Tenders, one souvenir photo with Mom and fresh flower for Mom. Child ticket includes admission to Rock City Gardens, Table Service Lunch with choice of Tuscan Garlic Chicken or Chicken Tenders, and coloring sheet with crayons. This combination ticket includes one admission to each attraction: Ruby Falls timed ticket, Incline Railway and a Flex Rock City Gardens valid any day. Ticket savings of up to $7.00 per adult and $3.00 per child off retail. Tickets expire one year from date of purchase. This combination ticket includes one Ruby Falls ticket valid for a specified date/time and a Flex Rock City Gardens valid any day. Ticket savings of up to $5.00 per adult and $2.00 per child off retail. Tickets expire one year from date of purchase. Views, Wonders, and History in 1 Package Deal! 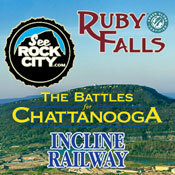 This combination ticket includes one admission to each attraction: Ruby Falls timed ticket, Incline Railway, Battles for Chattanooga, and a Flex Rock City Gardens valid any day. Ticket savings of up to $9.00 per adult and $4.00 per child off retail. Tickets expire one year from date of purchase. Includes general admission tickets - an upcharge will apply if visiting on a non-general admission priced day. **Please note: The ages for a child ticket at the Battles for Chattanooga child are ages 6-12. All other attractions are ages 3-12 for a child ticket. If your child is between the ages of 3-5, we recommend purchasing the Ruby Falls, Rock City, and Incline combination for that child. 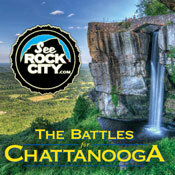 This combination ticket includes one general admission to each attraction: Rock City Gardens and Battles for Chattanooga. Ticket savings of $2.00 per adult and $1.00 per child off retail. Tickets expire one year from date of purchase. Includes general admission tickets - an upcharge will apply if visiting on a non-general admission priced day. **Please note: The ages for a child ticket at the Battles for Chattanooga child are ages 6-12. Rock City's child ticket is ages 3-12 for a child ticket. If your child is between the ages of 3-5, we recommend purchasing the Rock City general admission ticket for that child.